These highlights do not include all the information needed to use FIRMAGON ® (degarelix for injection) safely and effectively. 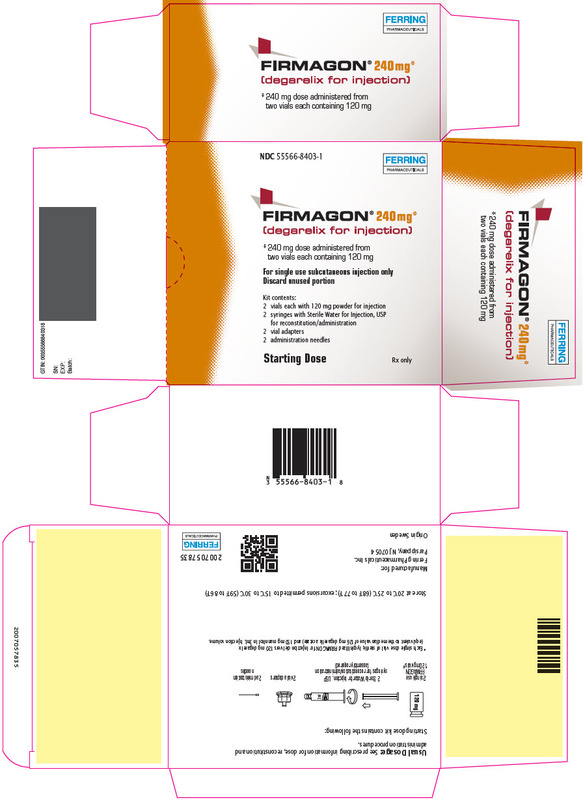 See full prescribing information for FIRMAGON. To report SUSPECTED ADVERSE REACTIONS, contact Ferring at 1-888-FERRING (1-888-337-7464) or FDA at 1-800-FDA-1088 or www.fda.gov/medwatch. 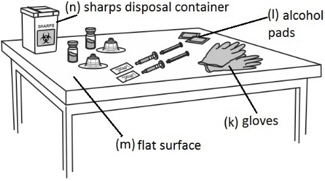 a sharps disposal container (n) for throwing away your used needles and syringes. 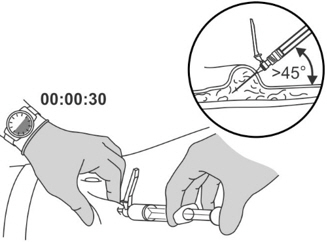 See "Disposing used needles and syringes" at the end of these instructions. 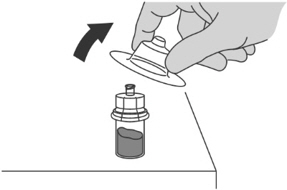 Press the plunger to the line marked on the syringe to expel all air bubbles. 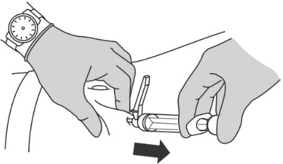 Press down with a firm, quick motion until a distinct, audible "click" is heard. 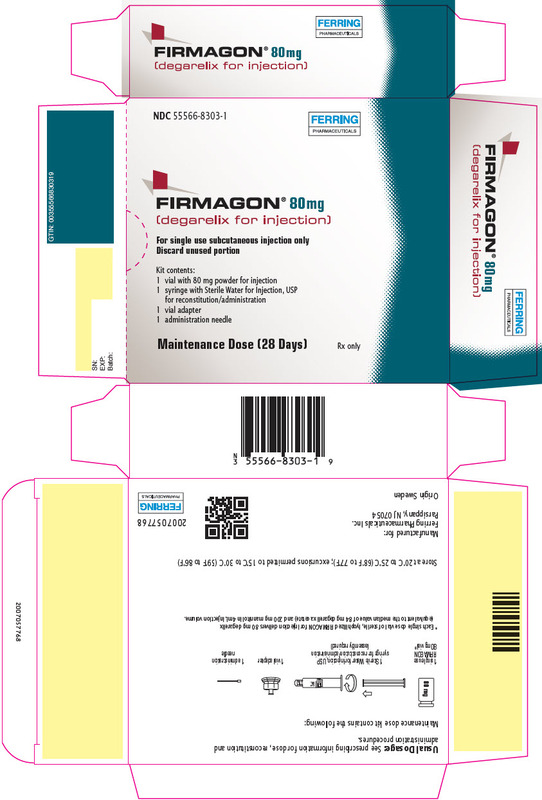 FIRMAGON is contraindicated in patients with known hypersensitivity to degarelix or to any of the product components. [see Warnings and Precautions (5.2)]. Degarelix is contraindicated in women who are or may become pregnant. Degarelix can cause fetal harm when administered to a pregnant woman. Degarelix given to rabbits during organogenesis at doses that were 0.02% of the clinical loading dose (240 mg) on a mg/m2 basis caused embryo/fetal lethality and abortion. When degarelix was given to female rats during organogenesis, at doses that were just 0.036% of the clinical loading dose on an mg/m2 basis, there was an increase post implantation loss and a decrease in the number of live fetuses. If this drug is used during pregnancy, or if the patient becomes pregnant while taking this drug, the patient should be apprised of the potential hazard to the fetus. Women who are or may become pregnant should not take FIRMAGON [see Contraindications (4) and Use in Specific Populations (8.1)]. Hypersensitivity reactions, including anaphylaxis, urticaria and angioedema, have been reported post-marketing with Firmagon. 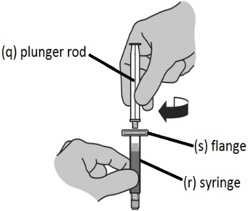 In case of a serious hypersensitivity reaction, discontinue Firmagon immediately if the injection has not been completed, and manage as clinically indicated. Patients with a known history of serious hypersensitivity reactions to Firmagon should not be re-challenged with Firmagon. In the randomized, active-controlled trial comparing FIRMAGON to leuprolide, periodic electro-cardiograms were performed. Seven patients, three (<1%) in the pooled degarelix group and four (2%) patients in the leuprolide 7.5 mg group, had a QTcF ≥ 500 msec. From baseline to end of study, the median change for FIRMAGON was 12.3 msec and for leuprolide was 16.7 msec.In the randomized, active-controlled trial comparing FIRMAGON to leuprolide, periodic electro-cardiograms were performed. Seven patients, three (<1%) in the pooled degarelix group and four (2%) patients in the leuprolide 7.5 mg group, had a QTcF ≥ 500 msec. From baseline to end of study, the median change for FIRMAGON was 12.3 msec and for leuprolide was 16.7 msec. FIRMAGON was studied in an active-controlled trial (N = 610) in which patients with prostate cancer were randomized to receive FIRMAGON (subcutaneous) or leuprolide (intramuscular) monthly for 12 months. Adverse reactions reported in 5% of patients or more are shown in Table 1. 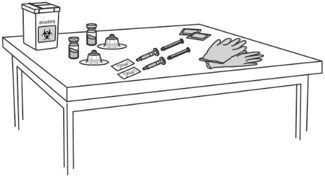 The most frequently reported adverse reactions at the injection sites were pain (28%), erythema (17%), swelling (6%), induration (4%) and nodule (3%). 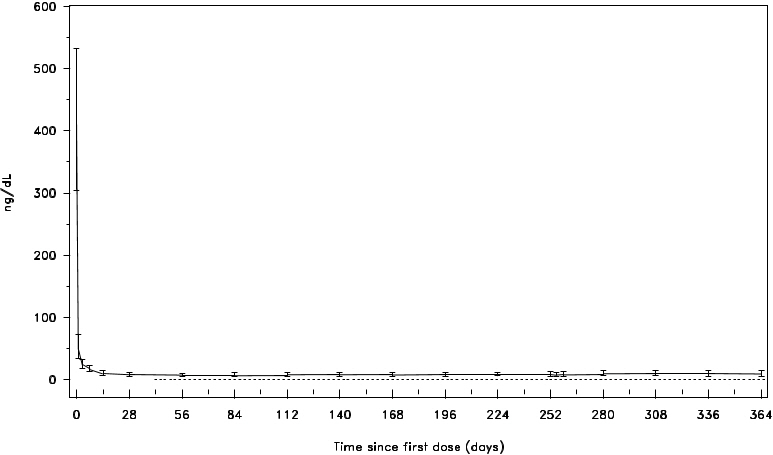 These adverse reactions were mostly transient, of mild to moderate intensity, occurred primarily with the starting dose and led to few discontinuations (<1%). 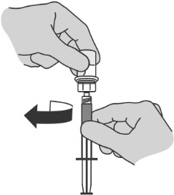 Grade 3 injection site reactions occurred in 2% or less of patients receiving degarelix. The following adverse reactions, not already listed, were reported to be drug-related by the investigator in ≥1% of patients: erectile dysfunction, gynecomastia, hyperhidrosis, testicular atrophy, and diarrhea. The safety of FIRMAGON administered monthly was evaluated further in an extension study in 385 patients who completed the above active-controlled trial. Of the 385 patients, 251 patients continued treatment with FIRMAGON and 135 patients crossed over treatment from leuprolide to FIRMAGON. The median treatment duration on the extension study was approximately 43 months (range 1 to 58 months). The most common adverse reactions reported in ≥10% of the patients were injection site reactions (e.g., pain, erythema, swelling, induration or inflammation), pyrexia, hot flush, weight loss or gain, fatigue, increases in serum levels of hepatic transaminases and GGT. 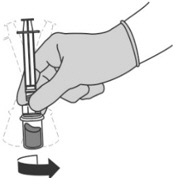 One percent of patients had injection site infections including abscess. 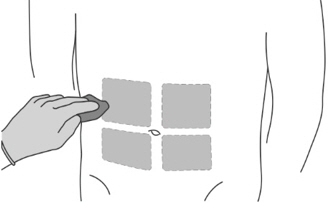 Hepatic laboratory abnormalities in the extension study included the following: Grade 1/2 elevations in hepatic transaminases occurred in 47% of patients and Grade 3 elevations occurred in 1% of patients. When degarelix was given to rabbits during early organogenesis at doses of 0.002 mg/kg/day (about 0.02% of the clinical loading dose on a mg/m2 basis), there was an increase in early post-implantation loss. Degarelix given to rabbits during mid and late organogenesis at doses of 0.006 mg/kg/day (about 0.05% of the clinical loading dose on a mg/m2 basis) caused embryo/fetal lethality and abortion. When degarelix was given to female rats during early organogenesis, at doses of 0.0045 mg/kg/day (about 0.036% of the clinical loading dose on a mg/m2 basis), there was an increase in early post-implantation loss. When degarelix was given to female rats during mid and late organogenesis, at doses of 0.045 mg/kg/day (about 0.36% of the clinical loading dose on a mg/m2 basis), there was an increase in the number of minor skeletal abnormalities and variants. 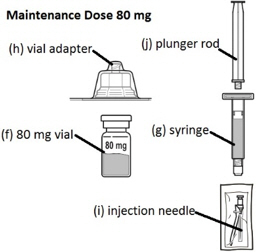 A single dose of 1 mg degarelix administered as an intravenous infusion over 1 hour was studied in 16 non-prostate cancer patients with either mild (Child Pugh A) or moderate (Child Pugh B) hepatic impairment. Compared to non-prostate cancer patients with normal liver function, the exposure of degarelix decreased by 10% and 18% in patients with mild and moderate hepatic impairment, respectively. 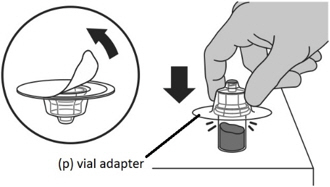 Therefore, dose adjustment is not necessary in patients with mild or moderate hepatic impairment. 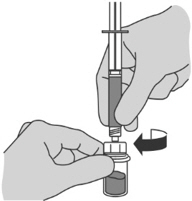 However, since hepatic impairment can lower degarelix exposure, it is recommended that in patients with hepatic impairment testosterone concentrations should be monitored on a monthly basis until medical castration is achieved. 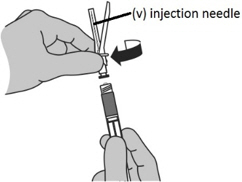 Once medical castration is achieved, an every-other-month testosterone monitoring approach could be considered. FIRMAGON is a sterile lyophilized powder for injection containing degarelix (as the acetate) and mannitol. Degarelix is a synthetic linear decapeptide amide containing seven unnatural amino acids, five of which are D-amino acids. The acetate salt of degarelix is a white to off-white amorphous powder of low density as obtained after lyophilization. The chemical name of degarelix is D-Alaninamide, N-acetyl-3-(2-naphthalenyl)-D-alanyl-4-chloro-D-phenylalanyl-3-(3-pyridinyl)-D-alanyl-L-seryl-4-[[[(4S)-hexahydro-2,6-dioxo-4-pyrimidinyl]carbonyl]amino]-L phenylalanyl-4-[(aminocarbonyl)amino]-D-phenylalanyl-L leucyl-N6–(1-methylethyl)-L-lysyl-L-prolyl. It has an empirical formula of C82H103N18O16Cl and a molecular weight of 1632.3 Da. FIRMAGON forms a depot upon subcutaneous administration, from which degarelix is released to the circulation. Following administration of FIRMAGON 240 mg at a product concentration of 40 mg/mL, the mean Cmax was 26.2 ng/mL (coefficient of variation, CV 83%) and the mean AUC was 1054 ng∙day/mL (CV 35%). Typically Cmax occurred within 2 days after subcutaneous administration. 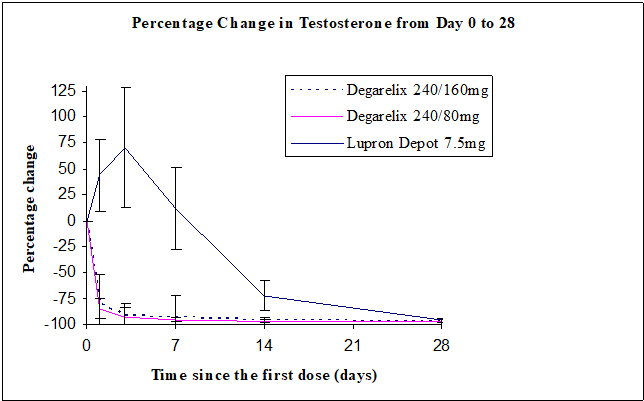 In prostate cancer patients at a product concentration of 40 mg/mL, the pharmacokinetics of degarelix were linear over a dose range of 120 to 240 mg. 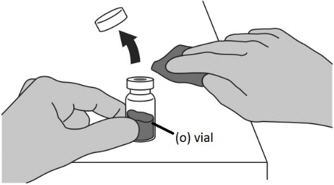 The pharmacokinetic behavior of the drug is strongly influenced by its concentration in the injection solution. 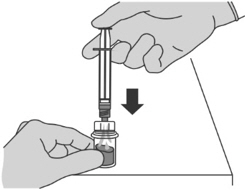 The distribution volume of degarelix after intravenous (> 1 L/kg) or subcutaneous administration (> 1000L) indicates that degarelix is distributed throughout total body water. In vitro plasma protein binding of degarelix is estimated to be approximately 90%. Following subcutaneous administration of 240 mg FIRMAGON at a concentration of 40 mg/mL to prostate cancer patients, degarelix is eliminated in a biphasic fashion, with a median terminal half-life of approximately 53 days. 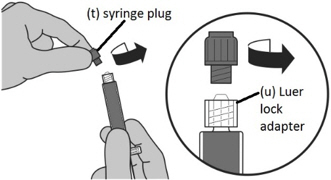 The long half-life after subcutaneous administration is a consequence of a very slow release of degarelix from the FIRMAGON depot formed at the injection site(s). Approximately 20-30% of a given dose of degarelix was renally excreted, suggesting that approximately 70-80% is excreted via the hepato-biliary system in humans. 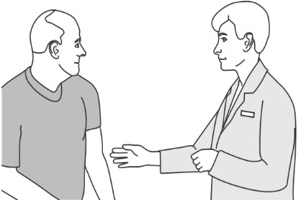 Following subcutaneous administration of degarelix to prostate cancer patients the clearance is approximately 9 L/hr. 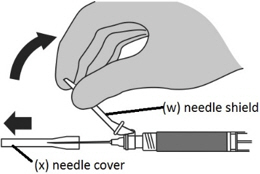 Degarelix was administered subcutaneously to rats every 2 weeks for 2 years at doses of 2, 10 and 25 mg/kg (about 9, 45 and 120% of the recommended human loading dose on a mg/m2 basis). Long term treatment with degarelix at 25 mg/kg caused an increase in the combined incidence of benign hemangiomas plus malignant hemangiosarcomas in females. 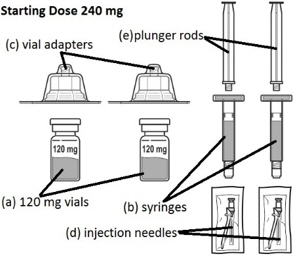 Degarelix was administered subcutaneously to mice every 2 weeks for 2 years at doses of 2, 10 and 50 mg/kg (about 5, 22 and 120% of the recommended human loading dose (240 mg) on a mg/m2 basis). There was no statistically significant increase in tumor incidence associated with this treatment. Single degarelix doses of ≥ 1 mg/kg (about 5% of the clinical loading dose on a mg/m2 basis) caused reversible infertility in male rats. Single doses of ≥ 0.1 mg/kg (about 0.5% of the clinical loading dose on a mg/m2 basis) caused a decrease in fertility in female rats. For more information, go to www.FIRMAGON.com or call -1-888-337-7464. This Patient Information has been approved by the U.S. Food and Drug Adminstration.